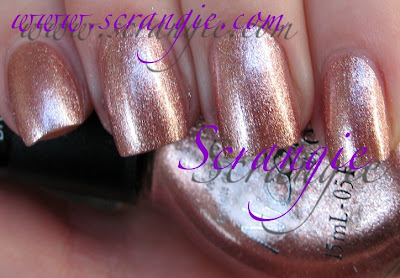 Here's Nicole by OPI's latest: A set of four super-sparkly foils. Technically these came out late last year, but they're part of 2011's spring colors. These feature the new Nicole Perfect Stroke brush, which is similar to OPI's ProWide brush, just rounder and flatter. It Starts With Me. This is a silver-based peach toned foil. It's not quite pure gold, not quite taupe. Miss Independent. A pink toned foil. Again, it has a silver base with a pale pink-purple overtone. This one is pretty unique, I can't think of another foil quite like this. Rich In Spirit. An aqua-blue foil. In certain lights it seems like it has a greenish tinge to it, in other lights it looks pure sky blue. The Next CEO. A good neutral gold foil with a little bit of a beige tone. The formula on these is good. Very smooth, not thick, not runny. Good coverage, I only needed two coats on all of these. Drying time is very fast. The new Perfect Stroke brush was much nicer in these than it was in the One Less Lonely Girl collection; none of the brushes in this set were crooked or defective in any way. Smooth, easy application and a nice glossy finish even without topcoat. These foils are extremely shiny and sparkly. While the colors themselves aren't terribly bold or exciting, the finish is amazing. They're like a cross between a true foil like Zoya Trixie, a chrome like China Glaze Millennium and a glass fleck sparkle. They are both reflective and sparkly/shimmery/borderline glittery and that's what makes these stand out. They aren't as dense of a foil as, say, Orly's Foil FX collection, but they're twice as sparkly. I like Miss Independent and Rich In Spirit a lot to my surprise! Normally I'm not really that into foils, they make my nails look all messy and wrong, even when I apply them perfectly. I think foils are really elegant, and I don't wear them very often to school or something. Gorgeous colours, I really love Rich in Spirt, great post. OOOO! this are reallly pretty foils! Ooooooooooooo! I'm not normally a foil kinda gal, but I'll have to check these out. My taste seems to be changing! I might like The Next CEO or Miss Independent! thanks for the posting these and stay warm up there! I know you Chicagoans really know winter but this is over the top! Also, I wonder.... Do they Konad well? Love The Next CEO, gotta get that one! Love foils. I only own one Nicole. Might have to buy a few of these. These all look really pretty and I'm glad to hear about the brush. How does It Starts With Me compare to Orly's Rage? I finally bought Miss Independant! I've been looking for the collection since you posted this, but it took quite some time before they were in stores! Thank you so much for the pictures, it's thanks to you that I discovered the colors. I LOVE/ADORE/WORSHIP Miss Independent. Totally in love with this nail polish! Just purchased Rich in Spirit for $2.00!!! So gorgeous!